I need to communicate with a lot of people. I need to make money for my efforts. I need to say/share more. ab Do we all have a desire now to communicate more freely with strangers in a more verbose manner with the hope of making money from the interactions? Is there an app that could combine all these needs? Many of us, ahem, have played the game “hot or not,” in which we quickly view a photo of a person and determine from one picture in less than 5 seconds if this person is hot or if they are unfortunately not. Thumb is a way to find out if you are hot or not, in a different way. Don’t have a friend around to tell you if you can pull off an outfit? No worries, snap a photo and find out what strangers think. I see great applications of this service by retail stores actually. Rather than rely on one sales associate to tell you that you look great in those jeans, have her snap a pic and find out if she’s right. The sales associates you can trust will have the crowd on her side. Facebook, Twitter, IM, text not easy enough for you? Now share links through sound with Chirp. You do not have to be connected on social networks to share. It’s another way to share with strangers (and friends) who are also using the app. And, not for strangers, but for companies and organizations looking for an easier way to hear lots of voices at once, there’s Conversations from HootSuite. Their site reads, “Invite anyone to chat within teams or to the entire company, push messages from social networks to conversations within HootSuite and discuss, like, retweet, even broadcast further to members’ own social networks.” Amen for no more “company wide” email chains that last two days and end with 20 emails exchanges about the rotting milk in the fridge. There was such an outbreak of controversy surrounding the idea of Instagram selling our photos that they went into full fledged damage control and updated their terms of service. However, it seems we are not opposed to selling our photos, videos, observations as long as we are in control of the process. Pheed does just that. Will be great to see how high the self-created pricing structure can get with these user generated photos and videos. Will it help celebrities with the plight of the paparazzi? Another new monetization network, Chirpify (no relation to Chirp above), simply allows users to click “buy” from sellers who are posting products to Twitter or Instagram. How’s that for instant gratification? Seems eBay should have tried this with their “Buy it Now” feature long ago. The creator of Twitter has recognized that perhaps 140 characters is not always the best way to share information and has started Medium, an invitation-only network with curated users generating longer form content where others can read and comment. I see a lot of opportunities for authors to use both Twitter to Medium. Post tweets along a single subject matter for a few days, see if it resonates, and then try out a longer form version of that on Medium. It’s a great way to gauge interest from Twitter first to see if an article can generate greater interest. One photo not enough? How about a better organizational tool to bundle multiple pictures into an album and share more than just a single 1000 words? Flayvr allows for that functionality so that your photo from two weeks ago is not lost in the ether of your camera roll. This album is now worth 15000 words. 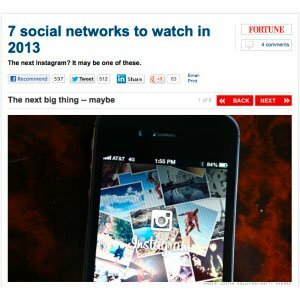 What do you think of these trends and how they are being answered with these CNNMoney social networks to watch?